Summer in the Carolinas is most certainly in full swing. I hope all y’all that live here have had a chance to get out and enjoy all of the great music, hip hop and cultural events that have been happening in both states over the past month and some change. I definitely have! Below are several upcoming events that y’all should check out. If you haven’t had a chance to really get out, take in some of the great music events the Carolinas has to offer plus enjoy the Summer, all of these listed below are fairly low cost options that won’t break your budget. Gear up, head out and have some fun! 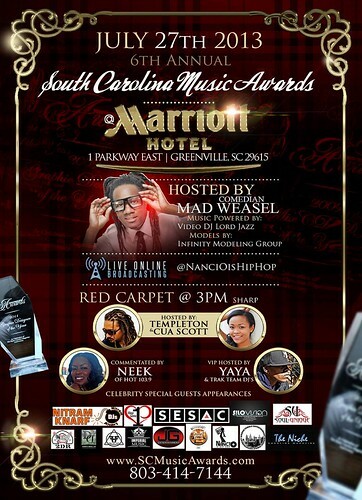 The South Carolina Music Awards is like a music family reunion for the SC music scene and 2013 is the 6th annual event. I’ve attended for the past three years and each year is always a blast. There’s a full weekend of events and activities to chose from. This year’s main event award show will be Saturday July 27 at The Marriott in G’Ville. The main after party is going to be an all out, Vegas-style, casino-themed party. Each year also culminates with a free, family friendly, community event. 2013’s “I Am A Legend” honorees will be SC natives DJ Scientist and Charlamagne Tha God. I will also be hosting the live online stream of the main event! Emcees Toon and The Real Laww return with the 2nd annual installment of their hip hop festival that’s based in The Bull City. I attended the DURHM Hip Hop Summit last year and wrote a review here. It was loads of fun, had great performances and was sold out. That’s a coup for an event in a college town when school is out. 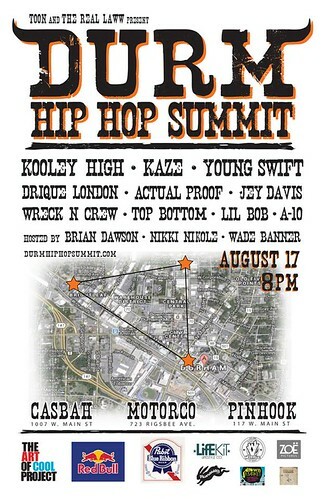 2013’s DURHM Hip Hop Summit has been expanded to include panels, a producer’s beat battle, plus break dancing and graffitti competitions. There are also now three different venues where various things will be happening. I have a feeling 2013 is going to be a blast! The Art of Cool Project (AOC) is a non-profit that presents and promotes live jazz, hip hop, soul and similar music throughout RDU (Raleigh-Durham-Chapel Hill), NC. So far for 2013, they have had a lot of super cool music events, many of which are free or reasonably priced, throughout the area. AOC brought DJ Jamad to Durham back in May. He’s put out some of the best Outkast remix projects throughout the years. AOC also presented a sold-out Bilal concert this past winter, Robert Glasper last year and way too many other cool events to name all of them here. 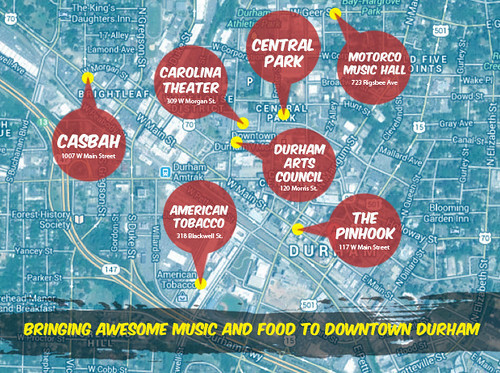 Now AOC is working to bring a full, two day mega music festival to downtown Durham. The festival will encompass 20+ performances, five venues, two outdoor stages and so much more. The headliner will be Kinston, NC native Maceo Parker. There will also be a food truck rodeo (which Durham has become famous for), day parties, panels and master classes. This entry was posted in Uncategorized and tagged Art of Cool Project, DURM Hip Hop Summit, SC Music Awards. Bookmark the permalink.